Manipal, Mar 30, 2017: “Yakshagana is a complete art form that takes us to the mythological world,” said Dr. Raghava Nambiar, a scholar of Yakshagana. Speaking at an art appreciation course for students of Manipal Institute of Technology, organized by the Centre for Creative and Cultural Studies (CCCS), Manipal University. Dr. Nambiar introduced the art form of Yakshagana, its identity, evolution and contemporary context to the students. 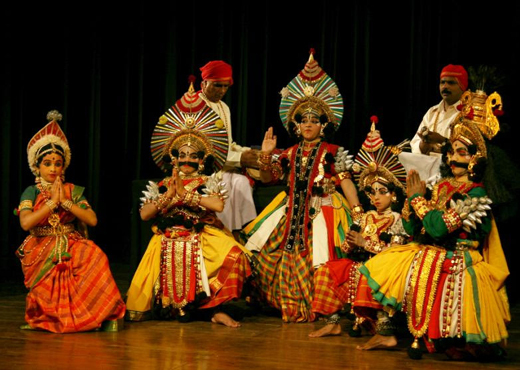 “It is unfortunate that Yakshagana is being diluted through numerous unnecessary changes. The very purpose of the Yakshagana is to create a parallel mythological world and offer a different theatrical experience to the audience,” he said. Every art form initially started as a folk form and later developed into a classical form through practice and incorporating intellectual and creative thinking. It also brought in the culture of a parallel literature, the kind of creative liberty nowhere seen in Indian theatre, Dr. Nambiar said. To give the audiences an essence of this art form, a documentary Bannadha Mahalinga based on the life and work of the prolific Yakshagana artiste, Mahalinga, was screened. The lecture followed by an interactive session in which various topics were discussed including the present scenario of Yakshagana. Varadesh Hiregange, Director of Centre for Gandhian and Peace Studies, chaired the session. Unni Krishnan K., professor, Centre for Creative and Cultural Studies, was present.